We all know what culottes are: slightly cropped wide pants that are very comfy to wear, and they’ve been in trend for several years already. 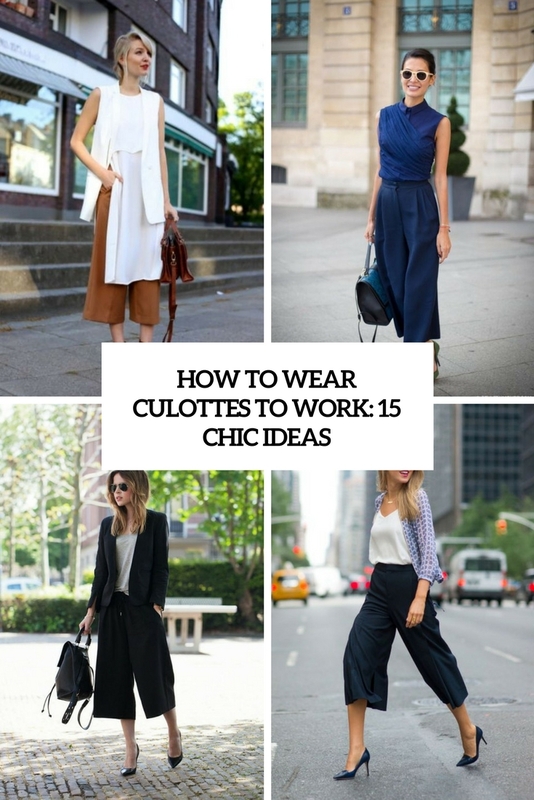 I bet you’ve already tried to compose outfits with them, and today I’ll share more ideas for inspiration: how to make work looks with culottes! Let’s start. Black and white are classics and they are the most popular colors for work looks. Make your look peculiar with black culottes! They can be only black or printed ones, and combine them with a white shirt, or a sleeveless top, and add black heels and a comfy bag – you are done! All-white looks with culottes are great to wear in summer, and you may wear a combo of culottes and a top with sneakers. Try to create colored looks with culottes in various colors and prints – you may go for bold culottes or for printed top and shirts, or for both at the same time. Take bold culottes and shoes and wear them with a neutral top and maybe a vest, or go for color blocking: navy culottes+a navy top and green shoes and some colorful bag. You are sure to stand out in such clothes!